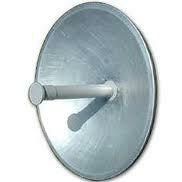 This standard microwave solid parabolic antenna consist of a parabolic shaped reflector spun from a sheet of aluminum. The antenna comprises of full Solid Paraboloid with 1.2 Meter (4 feet) diameter for use in digital and analogue microwave communication systems. The mounting arrangement of solid parabolic antenna permits to change the polarization from horizontal to vertical and vice-versa. All the screws, nuts and bolts of solid parabolic antenna are made of stainless steel. The parabolic shape focuses energy at the feed point of the antenna. This solid parabolic antenna have a narrow focused beam of energy and relatively high gain compared to many other types of antennas. Radiating elements and matching stub of solid parabolic antenna are made of Aluminum. The compact size of the antenna allows easy handling and specially designed mounting arrangement results in fast installation. The solid parabolic antenna operates at D.C. ground with low resistance discharge path for protection against lightning and for immunity to noise.